The legendary Swiss watch company Angular Momentum every time amazes everyone with his incomparable models, which can be called art. 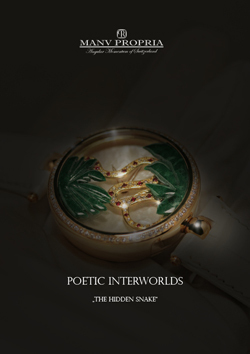 Mark is another masterpiece from the collection of Hidden Snake Poetic Interworld. Amazing model is presented in a round housing with a diameter 42.10 mm and a thickness of 9.8 mm in 18-carat white gold, set with diamonds VVS weighing 1.5 carats. 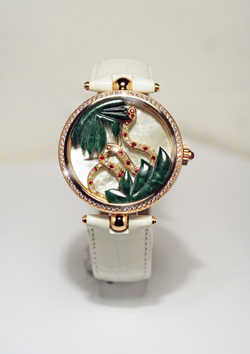 Mother of pearl dial, and hidden under the image of a snake arrow from rose gold watch gives an elegant and luxurious look. All of the unique innovations – shown on the face of the serpent of red gold with diamonds, rubies and lots of graining. Golden snake fixed arrows under the protective sapphire crystal, and a feeling that it looks like from green leaves made of jade. At the 3 o’clock position is 7 mm crown adorned cabochon Ruby. Note that this exceptional model is handmade in our own factory and assembled on the basis of historical manual mechanism FHF 96. Delivered in high quality watch strap white, which is harmoniously combined with the face of the same color.